For anyone else who has been following the Windows 8 development (probably no one reading this article, sigh forever a geek), it has been interesting seeing the change in their design paradigm toward a more touch driven UI (user interface). This change in design is primarily to unify the OS experience across all hardware platforms (PC, tablet, and phone), and I can’t argue with them, this makes sense. Apple is doing this with iOS and OSX, particularly with the latest version of OSX, where they brought over many UI elements from iOS over to OSX. Windows Phone 7, at least in my opinion, has an extremely successful UI design, and it makes sense for Microsoft to bring over some of that clean, information friendly design over to the desktop OS as well. In this Windows 8 unveil video you can see Microsoft demo a new dashboard type interface which is very similar to the Metro UI used in Windows Phone 7. 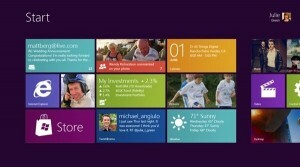 This dashboard has live tiles like in Windows Phone 7 providing live information about weather, email, stocks, etc. at a glance, which is nice. And no, the entire OS doesn’t look like this, you can hide this dashboard and see your desktop like normal, so don’t start panicking about how different it is. The problem I see with all of this is that the way users interact with a touch device is very different then how users interact using a mouse and keyboard. For example, for those of you who have used an iPhone, iPad, or Android device, have you noticed that to scroll down on a screen you push up, but on a desktop or laptop you pull the scroll bar down? In fact, in the latest version of OSX (Lion) Apple changed the default scroll method to a touch-interface like mode. Unsurprisingly this confused the hell out of many people after upgrading to Lion, but fortunately you can switch back to a more traditional desktop like scroll method in the preferences. Also, on a phone or tablet type device there is limited screen real estate, and generally fingers are pudgier and less accurate than a cursor, so on screen buttons need to be bigger, and layouts need to be finger friendly. Whereas most modern desktops and laptops have screen resolution galore, and for the most part we use a mouse or trackpad to interface with the computer which means that big spaced out buttons may not be the best design choice. What does all of this have to do with the original link that I posted above, not a whole lot really. The article briefly mentions that the ribbon is more touch friendly than dropdown menus, which I agree with. But other than that the changes to Explorer in Windows 8 don’t really have anything to do with the last 3 paragraphs that I just wrote. The point is that this is what happens when your train of thought derails and rerails (rerails?) while writing the same article. This entry was posted on August 29, 2011, 3:52 pm and is filed under FYI. You can follow any responses to this entry through RSS 2.0. Both comments and pings are currently closed.